In this post I will present the list of goalscorers from the MTN Ligue 1 2010, the highest level of football in Ivory Coast. At the time of writing, it is still uncertain when the 2011 season will start, hopefully in a matter of weeks. The picture is of Adama Bakayoko (born 01.01.1986), the top goalscorer in the 2010 season. 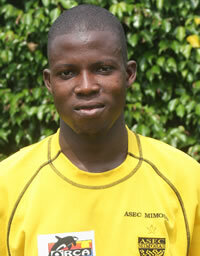 Bakayoko managed 15 goals for Sabé Sports de Bouna but will play for ASEC Mimosas in the upcoming season. Bakayoko is known for his speed speed and skill. The picture is taken from http://www.asec.ci. Elogne Arnaud Amon 6, N’Gna Yao Koffi 5, Ogou Edmond Akichi 2, Betio Gerard Amon Natchia 2, Gbagnon Anicet Badie 1, Madi Constant Romuald Gbogoua 1, Adou Gérard Koffi 1, Roméo Konan Koffi 1, Cheick Ahmed Tenena Moukoro 1, Yannick Zakri 1. Koffi Christian Raoul Kouamé 3, Idrissa Kouyaté 3, Goué Blagnon 2, Aboussy Cédric Gogoua 2, Sékou Sanogo 2, Karamoko Comara 1, Dalla Coulibaly 1, Franck Rouxel Derou 1, Landry Djédjé 1, Lébé Gnahoua 1. Apparently Africa Sports FC scored only 16 goals while my list of scorers implies 17 goals. Simon Kangoh 4, Alassane Karamoko 4, Hermann Kouao 4, Marius Blin Duhamel 2, Adama Hamed Diomandé 2, Dosso Gouaméne 2, Richard Malan N’Goran 2, Parfait Konan Kouakou 1, Yao Mathieu Kouamé 1, Pierre M’Bena 1, Issouf Sangaré 1, Remi Gabiem Vieron 1, Goals Missing 4. N’Doua Patrick Iréné Kouakou 8, Koffi Davy Bouah 7, Jean Brossou Kpéhi 5, Kessé Mangoua 5, Ange Pacome Dogba Gnagbo 3, Jean Michael Séry 3, Olarenwaju Kayode 2, Hugues Evrad Zagbayou 2, Yaw Frimpong 1, Didier Boris Kadio 1, Bakary Koné 1, Zahui Okou 1, Mohammed Latif Touré 1, Goals Missing 1. Yao Hermann Kouassi 9, Anicet Gildas Dago 4, Cheikna Hibrahim Bokoum 3, Mohamed Gariba 2, Hamadou Konaté 2, Guy Serge Brou Kouadio 1, Mohamed Ibrahim Diaby 1, Bassiriki Ouattara 1, Goals Missing 1. Ismaël Sy Savane 8, Boukari Ousmane Abdoulaye 3, Armand Boti Bi Tié 3, Zoumana Koné 2, Baba Ouattara 2, Komivi Dzimedo Tsogbé 2, Zan Pierre Guié Bi 1, John Kollie 1, Yves Konan Kouadio 1, Siaka Sow 1, Ibrahima Traoré 1, Own Goals 1, Goals Missing 2. Jean Imere Yao Krizo 8, Jean Emmanuel Assiri 2, Wilfried Kipré Bolou 2, Yves Kouamé Bolou 2, Samuel Fabrice Zokou 2, Jean Didier Aka Kouamé 1, Essoh Firmin Assiry 1, Etienne Dago Dja 1, Benson Diéhy 1, Eugène Koffi Kouamé 1, Alhassane Koivogui 1, Amani Justin Kouamé 1, Adama Ouattara 1, Goals Missing 2. Gnakabi Ottro 5, José Iritie 3, N’Guessan Albert Kouakou 3, Tchimou Babilas N’Goran 3, Charles Dié 2, Jean-Francis Kassi Malan 2, Franck Dali Okahué 1, Mohamed Awal Koné 1, N’Dri Fabrice Koaudio 1, Jean Noël Sahie Groyou 1, Euloge Ya Semon 1, Kobri Jonas Zokoury 1, Goals Missing 3. Tchétché Kipré 11, Laciné Traoré 4, Michaël Ogundina 3, Armand Boly 2, Guy Eric Dano 2, Rouxel Franck Derou 2, Mathias Kassi Akesse 2, Mihan Bosson 1, Goals Missing 3. Koelly Kevin Zougoula 9, Jean Serge Sery Dogo 5, Richmond Djé Konan 3, Ya Thomas Ronardo Gonazo Bi 3, Alexandre Kouassi Kouamé 3, Lamoudja Traoré 2, Yves Francis Beto 1, Hugues Magouhi 1, Goals Missing 3. Adama Bakayoko 15, Bazoumana Diabaté 3, Hamidou Diabaté 3, Gautier Koffi 2, Ibrahim Ouattara 2, Koffi Aboutou 1, Molo Hilaire Assale 1, Ezerka Emou 1, Guy-Hervé Nady Bi Bola 1, Boliguibia Ouattara 1, Ismaël Ouattara 1. Apparently Sabé Sports de Bouna scored 29 goals while my list of scorers implies 31 goals. Ladji Tiezan Koné 5, Kabran Stevens Koffi Foba 4, Ismaël Beko Fofana 3, Ousmane Adama Ouattara 3, Sédé Marc Dion 2, Romuald Koutouan Koutouan 2, Louis Iréké Agonhossou 1, Marius Blin Duhamel 1, Dieudonné Bohou 1, Souleymane Dembele 1, Ange Baresi Gloudoueu 1, Eugène Koffi Kouamé 1, Raoul Thierry Konan 1, Dogui Jules Gaël Lakpa 1. Garba Idrissa Halidou 8, Alphonse Kodjo Kassé 2, Laciné Traoré 2, N’Gagnanty Bamba 1, Georges Eric Bilé 1, Sékou Camara 1, Adama Coulibaly 1, Lawson Laté 1, Kouakou Mansou 1, Abdoulaye Ouattara 1, Désiré Tuo 1. Samba Diabaté 7, Jean-Baptiste Oulai 6, Koré Maixent Zagré 4, Mouhamed Ismaël Koné 3, Kouamé Martial N’Goran 3, Arsène Adom 1, Aboubacar Diomandé 1, Hervé Landry Guy 1. I am interested in contacting these players directly or via agents. I am in Cyprus have good chance to place them in Turkey as well. Please contact me. would like to kno how to get in touch with players.intrested in signing few players for a club in indian ileague.pls do contact via email.all queries can be discussed.